GRAND-PM’s Spare Parts Inventory Control module allows you to keep track of the parts and materials in a stockroom. You can record the receiving of parts and materials in the stockroom; report on parts and materials that need to be reordered; and list parts and materials you currently have on-hand. The system supports either simple or FIFO accounting methods and will track and report on supplier as well as internal transfer cost billing. GRAND-PM can also generate labels to use with bar code or keyboard wedge readers. Use it to set reorder thresholds and rules and track when and what was ordered as well as when the parts arrived. "Being able to store multiple vendors for every part helps us to order a part quickly and at a competitive price." "Just-In-Time Parts Delivery feature saved us thousands of dollars on ordering air filters." "Maintaining minimum quantity for critical parts assures the we are never left without essential repair parts and materials." "We identify ‘dead’ inventory on regular basis. This helps to minimize the inventory to optimal level and save money." 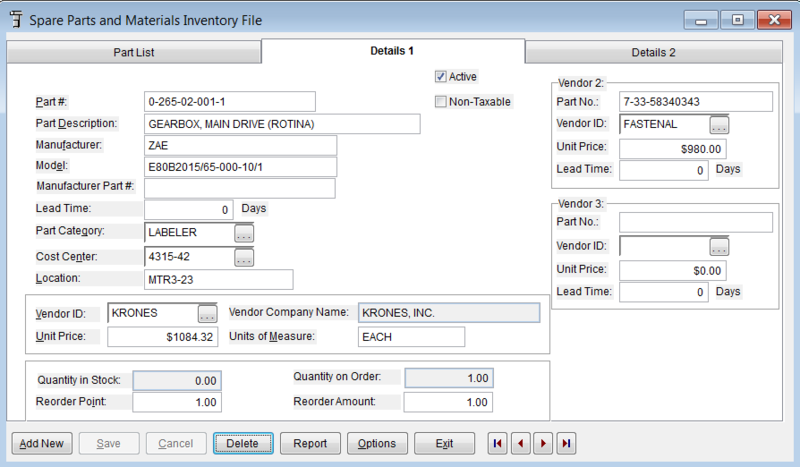 Click to view a sample screen of GRAND-PM Spare Parts Inventory Control module.